Unfortunately we'll be missing one of our best field athletes this outdoor season. Announced Wednesday afternoon by NorthJersey.com's Paul Schwartz, Sydney Woods of Northern Valley Demarest will miss her entire senior spring due to injury. The University of Pennsylvania bound pole vaulter was the state leader and our first team All-State selection this past winter season after five vaults over 13-00. The ankle injury took place just before NJSIAA Group Championships during Bergen County Championships on February 13th. She had cleared 13-00 and was attempting to break the state record, held by Danielle O'Reilly of Shawnee at 13-05 since 2004, but unfortunately in that attempt she came down awkwardly on her ankle causing the injury. She missed out on the rest of the season from there including Groups, MOCs, Eastern States, and New Balance Nationals Indoor. According to Paul Schwartz's article, surgery on March 4th went well and a full recovery is expected but she will not be competing this spring. Her indoor best of 13-0.75 is ranked NJ#2 all-time indoors and she is just the fifth girl in state history to clear 13-00 indoors or outdoors. 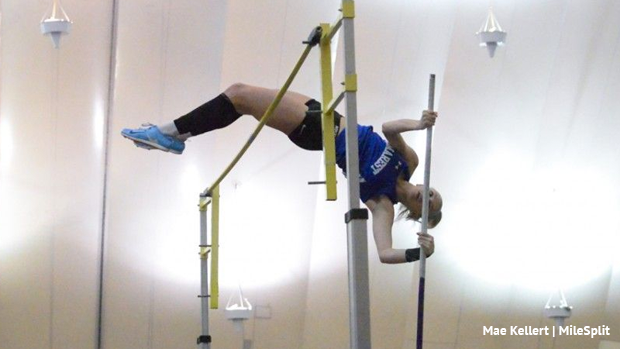 She was the second ranked outdoor returner from 2018 with a 12-06.5 clearance only behind Indoor Meet of Champions winner Caroline Dannenbaum of Pingry at 13-0.